'In glittering Newport, Rhode Island, at the close of the nineteenth century, status is everything. But despite being a poorer relation to the venerable Vanderbilts, Emma Cross has shaped her own identity--as a reporter and sleuth. Fancies and Fashion reporter Emma Cross is sent by the Newport Observer to cover an elite house party at Rough Point, the "cottage" owned by her distant cousin Frederick Vanderbilt, which has been rented as a retreat for artists. To her surprise, the illustrious guests include her estranged Bohemian parents--recently returned from Europe--as well as a variety of notable artists, including author Edith Wharton. But when one of the artists--an English baronet--is discovered dead at the bottom of a cliff, Rough Point becomes anything but a house of mirth. After a second guest is found murdered, no one is above suspicion--including Emma's parents. I do adore a historical mystery. I would have to say that this genre is my most favorite to read and enjoy. Alyssa Maxwell does not disappoint. This latest installment of an already fantastic series, is just the icing on the cake. Maxwell has a way with words and creating a mystery that will leave you guessing until the very end. I adore Emma's character and how she struggles with her famed family and being a poor relation having to make her own way in the world. Emma has gumption and doesn't take anything sitting down. She is out to make a name for herself and if she solves a few murders along the way, well then she has left her mark. There is an element of this book that really brings to mind the quintessential British manor house cozy mystery, where the guests are from all different backgrounds and there is a slew of clues and suspects. I always find myself enjoying these types of mysteries. I love seeing how every person could have had an opportunity or motive to commit murders. Maxwell delivers the same premise in this novel. The only element really linking the guests together are that they are all artists of some sort and that they are friends. Edith Wharton makes an appearance in this novel. I don't know a lot about Wharton, nor have I read any of her novels, but Maxwell makes me inquisitive about Mrs. Wharton and I want to learn more about who she was and what her life was like. The author gave me a glimpse into Mrs. Wharton's life in this book and her somewhat tumultuous relationship with her husband. I hope that the author plans to weave Mrs. Wharton into the future installments of this series as I would definitely like to see more of her character. I honestly have to say that there is nothing really that I want to to critique with this book. The characters were delightful, the story captivating and the sense of sadness when finishing an entertaining read certainly still lingers. 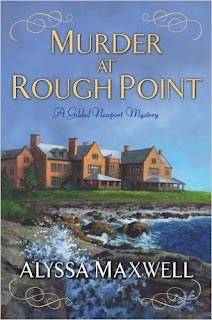 Maxwell is a phenomenal writer and her stories are always delightful and thrilling to read. 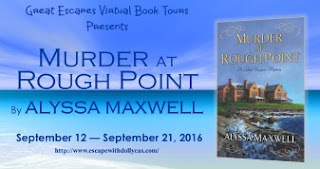 Alyssa Maxwell is the author of the Gilded Newport Mysteries and, beginning January 2016, A Lady and Lady’s Maid Mysteries. 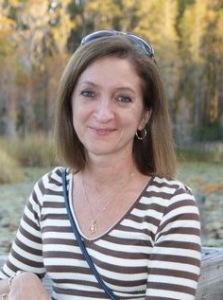 She lives in South Florida in the current year, but confesses to spending most of her time in the Victorian, Edwardian, and post WWI eras. If she only had a TARDIS... In addition to fantasizing about wearing Worth gowns and strolling the gardens of her manor house, she loves to watch BBC and other period productions and sip tea in the afternoons. She and her husband are the proud parents of two beautiful twenty-something daughters. This has been a stop of the Death Among the Doilies blog tour hosted by Great Escapes Virtual Book Tours. Make sure that you stop by the other stops as well! Disclaimer: This book was given to me by the publisher, through Great Escape Virtual Book Tours and Netgalley, in exchange for my honest review. I reviewed this book without compensation of any kind. All thoughts and opinions are solely mine. I enjoy books set in the turn of the last century - it is one of the most interesting times in history. i love this series and book. I am looking forward to reading it one of these days. Thanks you for your insightful review. I have read the previous books in this series and will say that it is THE best historical mystery series that I have ever read. 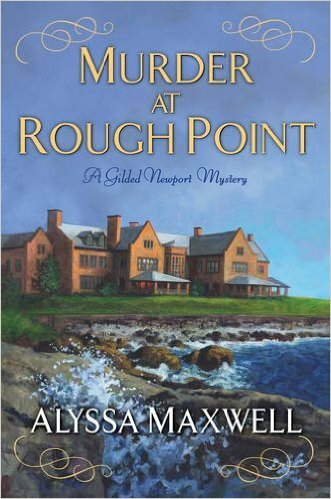 Love The Gilded Newport Mystery series. Also sharing with all friends not on Facebook. I love reading about the gilded age and this time period. Glad to know this is another excellent entry in the series. I'm dying (no pun intended) to read it. I'm too busy to take it to Newport and sit outside Rough Point (now famous for being the summer home of Doris Duke) and read it but I can aim for later in the fall or next year.